Gustave Caillebotte was an extremely gifted French Impressionist whose works have only recently begun to be recognized for the treasures that they are. Born into great wealth and privilege, Gustave was an avid patron of the arts, his own creations were more or less a hobby. He sold almost none of his paintings during his lifetime, instead he gifted them to friends and family where they remained in private ownership for decades. The resulting anonymity meant that the art world really only discovered him in the late 20th century. A man of independent means, Caillebotte was indeed a polymath, painting was just one string to his rather accomplished and varied bow; he studied law and engineering at university then later art and painting at the Ecole des Beaux-Art, he was a very accomplished yachtsman and naval architect as well as a keen horticulturalist and photographer. However, it is for his generosity to struggling artists and his own fine paintings that he is most well-known, and now considered one of shining lights of the French Impressionist movement. On his sudden and untimely death at aged only forty-six, he left over five-hundred of his paintings for us to finally enjoy today. The French impressionists were a group of artists who rebelled against the rigid and stuffy conventions of the art establishment of the time; the Ecole des Beaux-Arts. The school set down strict guidelines regarding style, form, composition and subject matter, clearly outlining what they considered "art" and anything outside of their remit, indeed anything creative, was considered unacceptable. The Impressionists insisted that life was art. They worked to bring the true colours, subjects and feelings of everyday life into their paintings. All this, much to the disgust of the art critics of the day. Needless to say, with his love of detail and "real" subject matter, Gustave's experience at the school was somewhat stifling. He did however meet and befriend the young Edgar Degas there, who in turn opened the doors to this new and radical new brotherhood. Impressionism was a natural fit for Caillebotte's realistic and honest style. Gustave's first and perhaps greatest work, The Floor Scrapers (1875) was rejected by the school's Salon for display. They claimed that the painting was vulgar in its honesty depicting shirtless, working men repairing a parquet floor. The painting is exquisite in its detailing and has an almost earthy quality to it. While the critics of the day dismissed it as non-artistic, the impressionists praised it as a great work, and they invited Caillebotte to display it, and seven other paintings in their second exhibition of 1876. Caillebotte's paintings typically had very pedestrian subject matter. He depicted ordinary people going about their business, and the landscapes he saw around him. Indeed, in the early days of photography, it is clear to see how the realism of the budding art-form influenced Gustave’s own creations. In Paris Street, Rainy Day (1877) Emile Zola, famed critic of the time, suggested that the picture may have been created from a photograph, it is so life-like. The flatter colours and realism became a common style for Caillebotte, setting him slightly apart from his fellow impressionist with their vivid colours and blurred details. He is, in fact, considered by many to be more of a realist or neo-impressionist, similar to American, Edward Hopper, due to the persistence of the photo realist style. However, Gustave was somewhat of an artistic chameleon as he would change style to suit the subject. Many of his works are truly impressionist, in the manner of perhaps Renoir, especially when he is trying to convey the peace of the countryside or water as in his, Boating on the Yerres (1877). A recurring technique of Caillebotte's, which is perhaps again influenced by his love of photography, is the feeling of zooming in on the subject of the composition. To achieve this, he often used a tilting floor or plane to great effect. His use of perspective is certainly part of his genius as seen in his, Young Man at His Window (1875) and later in his Boulevard Seen From Above (1880) both of which draw the viewer in to a distant place within the painting by clever use of colour and light. When Gustave was first invited to display his work with the impressionists in 1876, he was drawn into acquaintance and friendship with a veritable "who's who" of French art. No doubt astonished by the great talent surrounding him, from Renoir and Degas, to Monet and Pissarro, Caillebotte became almost instantly involved in both organising and funding continued exhibitions. It is clear that Gustave had great respect for his fellow impressionists as he not only bought many of their works, but he actually supported them financially so they may continue to paint; most notable Monet himself whom he set up in a studio. As Caillebotte was of independent means, he was certainly aware of the fact that the geniuses around him were starving for their art and he did everything he could to ensure that they could continue to work and display their important works. Indeed, such was his devoted patronage, that he grew an extensive private collection of impressionist art he bought in support of his contemporaries including Manet's The Balcony (1869), Monet's Luncheon in the Garden (1874) and Renoir's Girl Reading (1874). Gustave's legacy to art, France, and the world is many fold. A brilliantly astute man, Caillebotte knew that even though he, himself admired the impressionists, the world in general was not ready. That is why, on his death, when he left his entire collection of sixty-eight paintings by assorted impressionist masters to the French State, he had one provision. Caillebotte stipulated, that in order to ensure that these mis-understood paintings did not just disappear into some store cupboard, they must be displayed in the Luxembourg Palace as part of the living artist collection and there after to the Louvre. Remarkably, even after several rounds of negotiations, Gustave's executor, Renoir, was only able to convince the government to take thirty-eight of the paintings, and the remainder were sold to a private American collector. However, the thirty-eight paintings that did go on display at the Luxembourg Palace were the first Beaux-Arts sanctioned display to be mounted in France for the general public to enjoy. It seems that may have been Caillebotte's ambition fulfilled. Gustave's collection is of course not his only legacy. His own masterful works have influenced both those who worked with him and those who came after. However, without doubt, his most profound endowment has been the more than five hundred of his own work which are only now being discovered by art lovers world-wide. 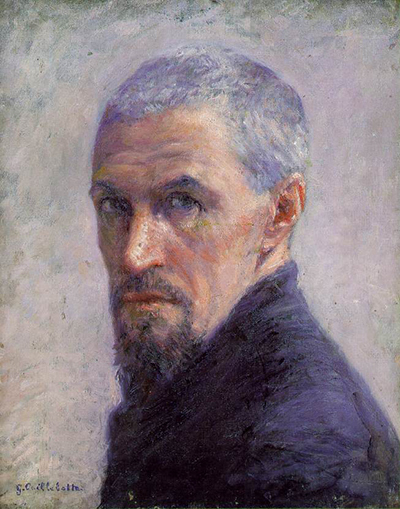 A great talent in his own right, Caillebotte's work is both beautiful and technically profound, and well worth seeking out wherever they can be found. Today, the French Impressionist Masters fetch multi-million price-tags including Gustave's own works; Man on his Balcony, Boulevard Haussmann (1880) sold in 2000 for more than $14 million. Finally, Gustave can take his place among the greats where he belongs. Gustave Caillebotte was a prominent French painter whose finest paintings can be found within this website, along with a wealth of information on the artist himself. Famous paintings by Gustave Caillebotte included the likes of Rainy Day in Paris, Floor Scrapers and Roofs Under Snow plus several self-portraits and still life works. Caillebotte still has a large number of followers within France and the rest of Europe who regularly buy reproductions of his original paintings as framed or unframed art prints, posters and stretched canvases.